Some performances play it "as written" [Koopman], but some play the 1/16 notes delayed and shorter (something like 1/32) [Gardiner, Harnoncourt, Savall]. I don't recall shortening the 1/16s as a common baroque practice. Are there any performance instructions, historical notes or research as to why they can be played this way, and is this considered the historically informed way? In baroque practice by playing them as 32nds you are not shortening the sixteenths. You are shortening that figure, like you would with a crushed grace figure (acciaccatura), crushing the notes toward the quarter note. The emphasis in any grace figure whether notated as such belongs to the main note (the note being led to by the figure). Unfortunately there are no recordings of Händel’s orchestra. Cultural practices varied in rhythmic interpretations during this period. If it were French music we’d be discussing the practice of notes inégales. With Händel there is an interesting mix of the German and English styles. With Händel at the podium I would imagine his own style permeated the orchestra, whatever that style happened to be. My personal experience in orchestras has resulted in performing this piece both ways. When I asked the thirty-second-note conductor why he wanted it that way, he said it was how he had been taught to interpret it, turning those notes into acciaccaturas leading into the next measure. So at least part of your answer is it's a taught tradition. Whether that tradition leads all the way back to the time of Handel might not have an answer. Not the answer you're looking for? Browse other questions tagged performing history baroque-period performance-practice or ask your own question. What is the best way to learn to sing harmony? 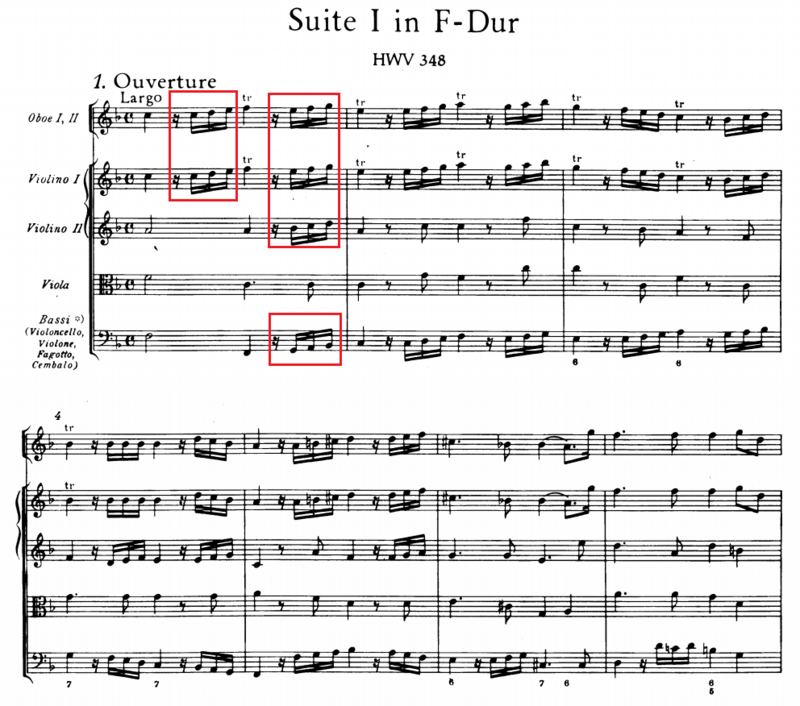 Why did composers of the Baroque sometimes write two of the same dance in a suite? Did baroque composers expect you to “bring out” the voices in their pieces, the way today's critics seem to enjoy in players? What led to the historical predominance of the four-part harmony in Western Music? What genre of music is the most complex? In the baroque period, did soloists play all the way through concertos?